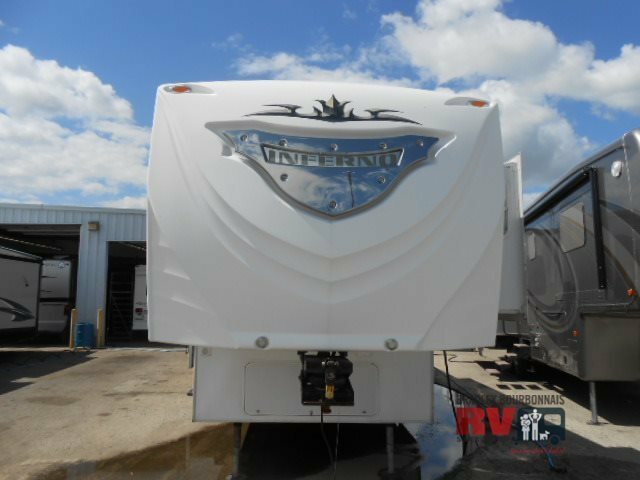 Inferno Fifth Wheel Toy Hauler by KZ w/Rear Cargo Area w/Opt. Power Beds, Loft Bed, Side Entry Door in Cargo Area, Opt. Keg or Washer/Dryer or Storage in Rear, Steps Up To Loft Bed, Countertop w/Sink & Overhead Cabinets, 3 Burner Range w/Micro./Refrig. & Hide-A-Bed Slide Out, Large U-Shaped Dinette Slide Out w/Overhead Storage, Ent. Center, Step Up to Side Aisle Bath w/Angle Shower, Private Master Suite Entrance, Queen Bed Slide, Closet, TV Cabinet, Dresser and Much More! 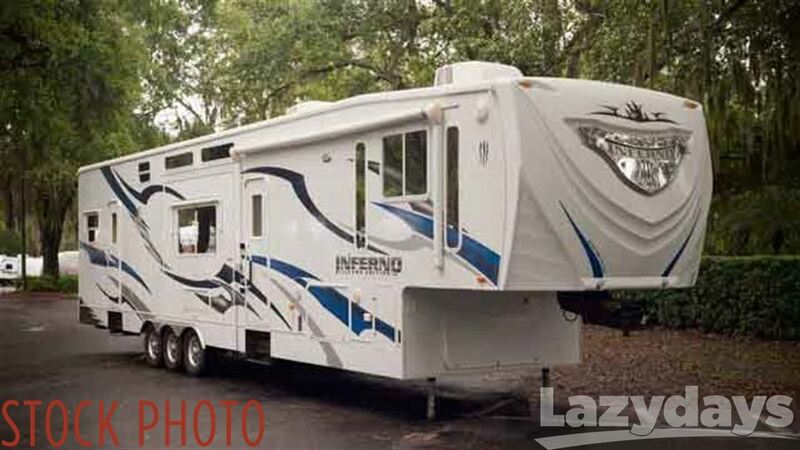 2009 KZ Inferno 4012, Inferno Fifth Wheel Toy Hauler by KZ w/Rear Cargo Area w/Opt. Power Beds, Loft Bed, Side Entry Door in Cargo Area, Opt. Keg or Washer/Dryer or Storage in Rear, Steps Up To Loft Bed, Countertop w/Sink & Overhead Cabinets, 3 Burner Range w/Micro./Refrig. & Hide-A-Bed Slide Out, Large U-Shaped Dinette Slide Out w/Overhead Storage, Ent. Center, Step Up to Side Aisle Bath w/Angle Shower, Private Master Suite Entrance, Queen Bed Slide, Closet, TV Cabinet, Dresser and Much More! 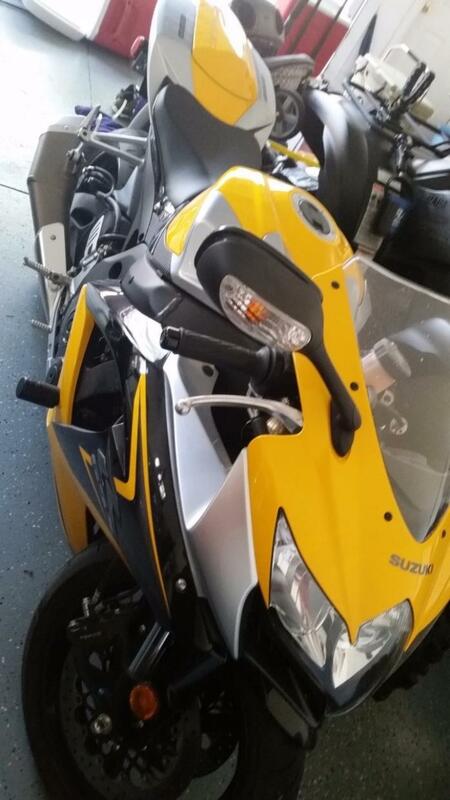 DESCRIPTION: Up for sale is a 2008 KZ Inferno 4012-SL. This 5th wheel is 42.5 feet long and the GVW is 18,000 lbs. Empty weight is right about 14,000 lbs. I purchased this RV new at the end of 2008, I've used it over the last 7 years as a home away from home when I worked out of town. Its almost always spent a year or more in one place at a time, its only been moved about 8 - 10 times and has been towed less then 5000 miles in total. I've had quite a bit of custom work done in this unit to make it as comfortable as possible. I had a custom laundry closet and clothes closets installed in the toy room and an all in one washer and dryer combo installed (vented model). I also had a dish washer installed in the kitchen to help with cleanup. Its an 18" apartment model which will do a complete 4 place dinner setting and a few pots too. Custom air filtration system installed in the main air conditioner to help with dust etc. It uses a standard 14x14x1 filter which can easily be replaced. Also had another 13,500 btu air conditioner installed in the toy room to help keep things cold. 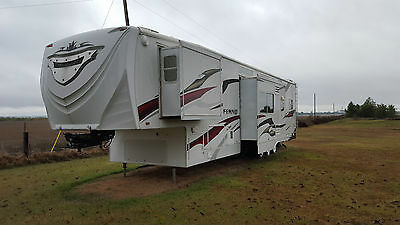 This 5th wheel has a total of 3 Coleman air conditioners installed and will absolutely freeze you out. Yes they all run on a 50 amp service no problem. When I purchased the unit I had planned on traveling and camping off the grid a lot which never actually happened but I ordered it with the factory installed Onan 5500 watt gen set and 25 gallon fuel tank. I never had much reason to use the generator as I was always in an RV park it has less then 50 hours on it. I also had 6 solar panels installed 5 simions (think they are 90 watts each) and 1 bp solar panel which is about 80 watts. Also had a 2000 Watt Xantrax inverter charger installed which has its own sub panel and the factory converter was removed. The factory model was only a 60 amp charger and the inverter has a 3 stage 100 amp charger which is much better to maintain your batteries. I had a custom battery compartment installed beside the generator that currently has 4 Trojan 220 amp hour batteries installed (its designed to hold up to 6 batteries total). The batteries were purchased new in 2012. I also had a Xantrax C-35 Charge controller installed to regulate the solar panels and its connected directly to the battery bank. Xantrax remote generator start has also been installed, what this unit does is if the battery bank drops below a certain voltage that you set then it will start the generator to charge the battery back up so your fridge, furnace or whatever will continue to run while your away. Also is connected to the air conditioner so if the thermostat turns the air conditioner on and your not connected to shore power your generator will start and run until the temperature in the unit drops below your set point (great if you have pets in the RV in the summer). In the back toy room I had it converter to a bedroom for my kids when they came to visit. I had a floating hardwood floor installed custom entertainment center. Added another bunk bed with another stair case that has additional storage built in. Entertainment center is built on a lift so it can be used for the couch or for the bunk bed above. Its on an electric lift so just push the rocker switch up or down and set it to the desired height. The back ramp/door is still fully functional and so is the screen wall so you can still load a motorcycle or a small golf-cart in the back of the unit (you would have to reinstall cargo tie downs). Water heater is a gas or electric 12 gallon unit and the fridge is a 12 cubic foot model which had the coils replaced in late 2013. 100 Gallon fresh water tank and water pump. Not sure of the sizes of the gray and black tank but think they're around 60 gallons each and there is 2 gray water tanks and 1 black water tank. Over all condition of the unit is fair, its always been stored outside when not in use and the logos and decals are faded and cracking. The outside slide out seals are in very poor condition and will need to be replaced. Seems to be pretty easy to do but I just don't have time to work on it currently. The kitchen slide had a leak at one of the seems and has caused the ceiling panel of the slide out to show water damage also there is a tear in the floor where an object was caught under the couch not very noticeable. The top of the slide seems solid but again the inside panel shows damage. The living room slide out has also leaked and has left mold stains under the dinette. The couch in the back toy room will absolutely need to be replaced as my puppy loved the foam inside and has chewed several large holes in the couch, please see pictures. The mattress in the bedroom will also need to be replaced, its firm and comfortable but has stains on the mattress itself. Over all the RV is in good solid condition with the exception of the above mentioned problems which would need to be fixed. If you would like additional information or photos please feel free to ask! Please Note: 5th wheel is stored in Forrest City Ar, which is about 90 miles east of Little Rock AR and about 45 miles west of Memphis TN. You must pickup or arrange for pickup of the fifth wheel. Obviously item must be paid in full with all funds cleared before picking up. Clean and clear title in hand ready to be singed over to new owner. 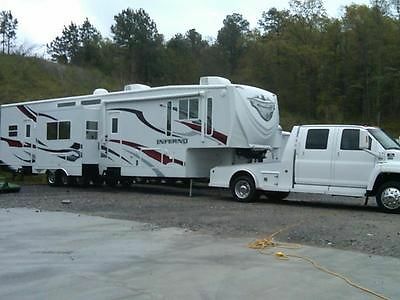 HUGE clean gorgeous 42' toy hauler 5th wheel! Has 12' garage in back with fold down ramp. Great place for those 4 wheelers, motorcycles, go-carts, or even a small car. Even has a gas station to haul extra gas for your toys!This guy is so big, you could live in it as a park model or tiny house. 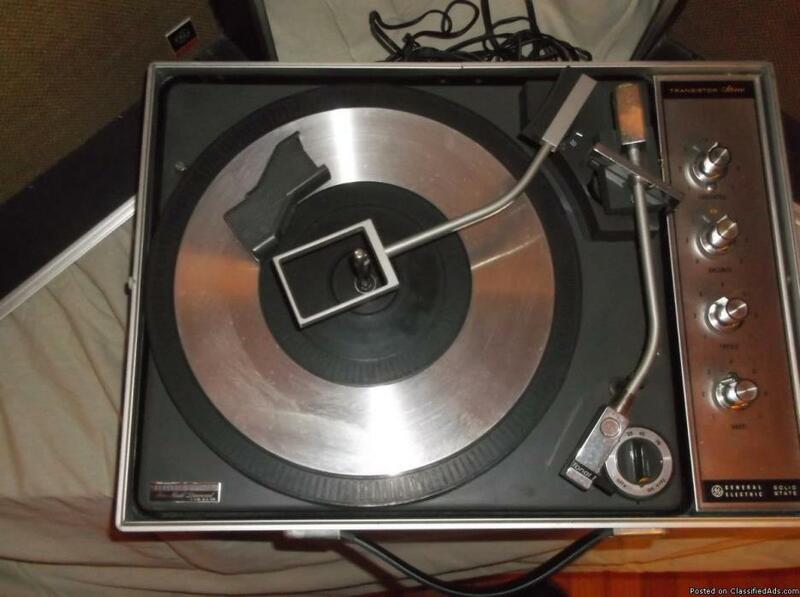 Has washer/dryer unit as well. 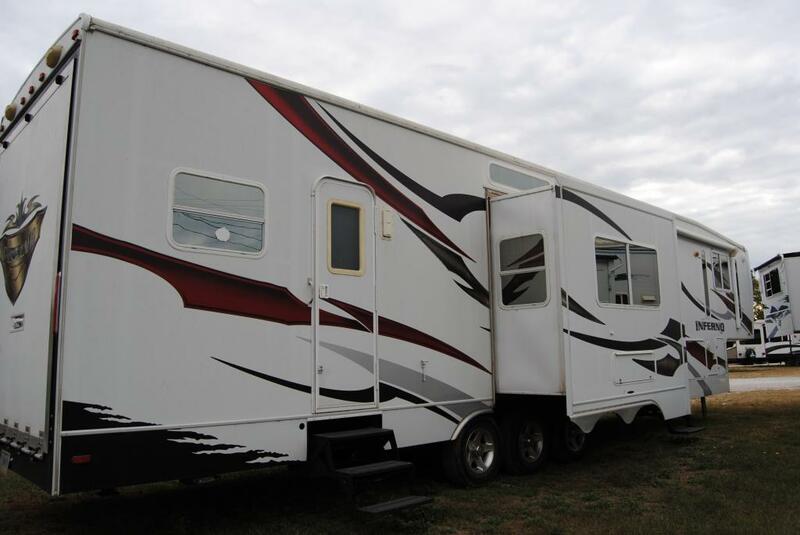 For complete specifications on this trailer- google 2008 KZ INFERNO 4012SL TOY HAULER SPECSClean? YES!! Always stored inside and is very clean. Come see it, you will not believe it!Parked in Warrenton MO. 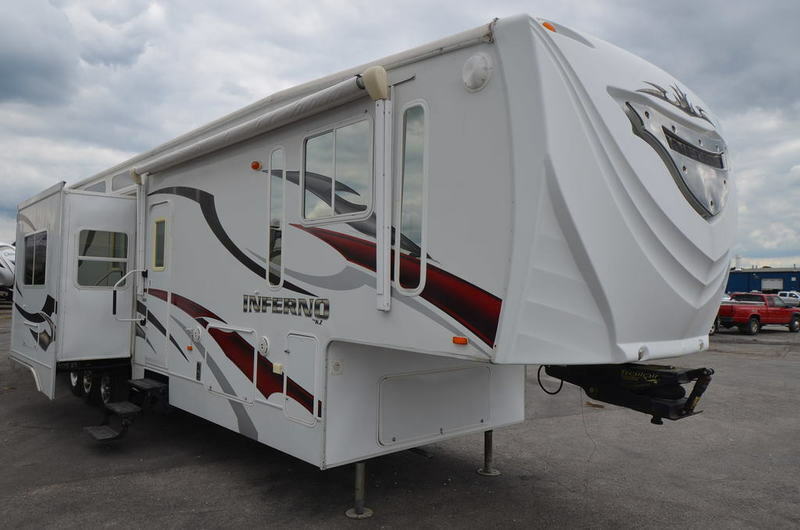 2009 KZ Inferno 4012,Inferno Fifth Wheel Toy Hauler by KZ w/Rear Cargo Area w/Opt. 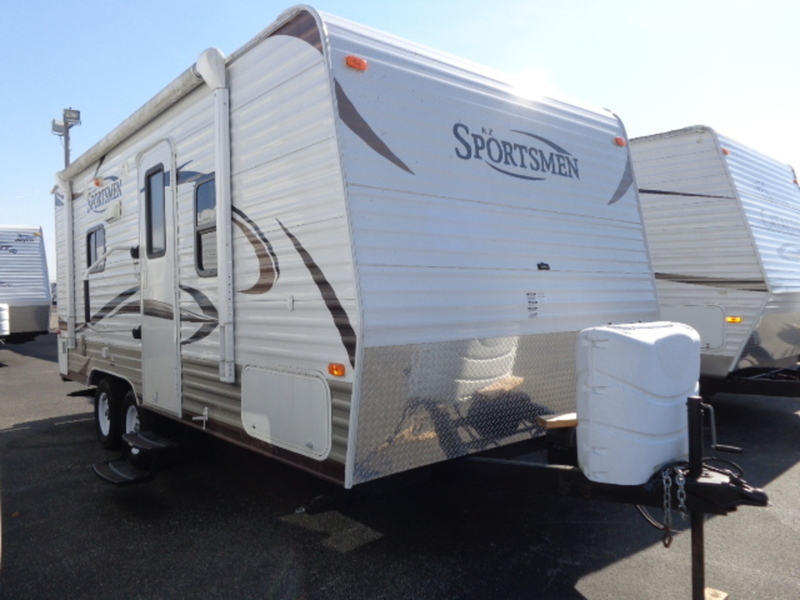 Power Beds, Loft Bed, Side Entry Door in Cargo Area, Opt. 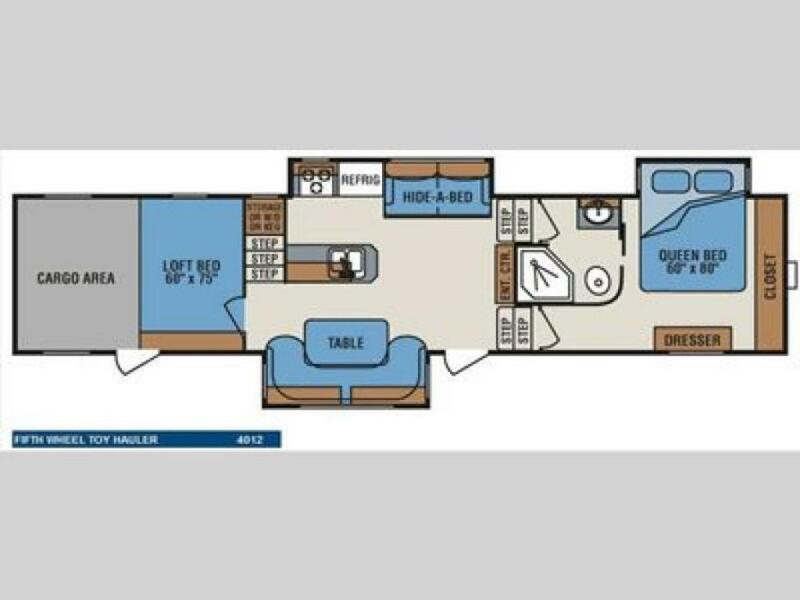 Keg or Washer/Dryer or Storage in Rear, Steps Up To Loft Bed, Counter top w/Sink & Overhead Cabinets, 3 Burner Range w/Micro./Refrigerator & Hide-A-Bed Slide Out, Large U-Shaped Dinette Slide Out w/Overhead Storage, Entertainment Center, Step Up to Side Aisle Bath w/Angle Shower, Private Master Suite Entrance, Queen Bed Slide, Closet, TV Cabinet, Dresser and Much More!